On Friday, October 16, our group of five – two master students, three bachelor students, and I – set out from the Institute of English and American Studies at the University of Oldenburg for a four-day excursion to the ecological field station of the University of Potsdam in Gülpe. This small village is located approximately 70 kilometers northwest of Potsdam, or circa 85 kilometers northwest of Berlin, along the eastern border of the Nature Park and Dark Sky Preserve Westhavelland. Here, we wanted to study, debate, and directly experience darkness in an area that still afforded a phenomenon that is increasingly lost to our brightly illuminated European continent: dark night skies. The plan for this long weekend was to have the afternoons set aside for text discussions and to venture out into the dark after the moon had set. The mornings were free to either recover from our nocturnal activities or to explore the wetlands of our immediate surroundings. Included in our considerable amount of luggage – the ecological field station requires self-catering – were three seminal texts for our ecocritical studies of darkness: Richard Louv’s Last Child in the Woods: Saving Our Children from Nature Deficit Disorder (2005); Paul Bogard’s The End of Night: Searching for Natural Darkness in an Age of Artificial Light (2013); and the chapter entitled “Ridge” from Robert Macfarlane’s The Wild Places (2007). Although the titles of the first two books express a sense of loss and therefore suggest a yearning for an earlier, better, more “natural” life, Louv and Bogard both investigate the Anthropocene with an attitude that combines curiosity, fascination, and pragmatism rather than regression, nostalgia, and moralizing. We spent most of our discussion time on The End of Night, the structure of which Bogard models his journey from the brightly lit urban centers of America (Las Vegas) and Europe (London and Paris) to natural dark places on the Bortle scale, beginning with the number 9 – for the bright inner-city night skies – and then counting the chapters down to number 1 – for the “truly dark site[s]” (9). 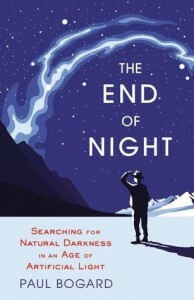 Not only did Bogard’s book provide us with an excellent preparation for our nightly activities, but it also related well to our own experiences, not least because the weather did not allow for any stargazing during our four-day stay – a disappointment that Bogard’s journey in search for natural darkness likewise relates. For example, a sandstorm prevents his opportunity for superior stargazing through “the world’s newest major telescope” (201), the Gran Telescopio Canarias, on the island of La Palma; and during his one and only night on the Isle of Sark, the world’s first International Dark Sky Island, the clouds intervene with his planned stargazing. Our group took considerable consolation in Bogard’s failed night sky experiences, and I greatly applaud my students for not allowing the persistent cloud covers to spoil their enthusiasm for our studies of darkness both during the day and night. Notwithstanding the ever-present layer of clouds, the excursion taught me a lot about dark skies or, as Bogard calls it, I indeed got to know darkness. Although I did not “get that feeling of infinitude” (Berman qtd. in Bogard 34), that sense of dizziness and falling that a truly dark yet clear and three-dimensional night sky with its multitude of stars may provide, the darkness that I got to know on our nocturnal walks is now a richer, more intimate, and also more valued part of my daily life. First of all, I learned the difference between “good seeing” and “bad seeing.” As the American astronomer Bob Berman explains to Bogard: “Seeing reflects the effect of turbulence in the earth’s atmosphere on the sharpness and steadiness of images – good seeing if the atmosphere is steady and calm, bad seeing if it is especially turbulent” (qtd. in Bogard 30). It was almost as if the nights with good and bad seeing took turns during our excursion, and the difference between the two was quite remarkable. As somebody who has worn glasses almost all her life, whenever we had a night with bad seeing, I felt insecure and as if I had to walk or be outdoors without my glasses; whereas during the nights with good seeing I felt comfortable and almost in full control. The fact that the colors are reduced to white, silver, black, and various shades of grey at night was not unknown to me. This past spring, I had undertaken a moonlight walk in the Canyonlands National Park, Utah, consciously experiencing the bright and beautiful colors of the desert during the day and the absolute lack of these colors at night: all the flaming pinks and reds of the rock formations were gone and instead showed their black outlines against the shimmering whites of the sandy path I had chosen for my moonlight walk to the Mesa Arch where I was going to wait for the sunrise. However, the full moon washed out the darkness and thus reduced the color contrasts considerably, whereas on our excursion we waited until the moon had set. We even witnessed the turning off of some of the lights in the surrounding villages and towns. As a result, the darkness and night vision that emerged were undisturbed by the brightness of the moon, and there were very few light sources on the horizon. For our first night, we had prepared our flashlights by placing transparent red paper over them so that our eyes could better adapt to and retain the night vision. The eyes’ adaptation to darkness is, as I learned in the course of the following nights, a slow process that requires time and patience, especially with aging eyes like mine. Once my eyes had adapted, however, I was amazed about the quality of the night vision, especially when there was good seeing. Indeed, as Bogard writes, “[t]he human eye has amazing ability to adapt to different lighting levels, including levels we normally think of as quite dim. While the human eye will never match those of truly nocturnal […] animals, in dimly lit situations our pupil expands, our iris relaxes, and […] given time to adapt to low light levels – levels that would allow the stars back into our skies […] – we actually see fairly well” (72). Once we had tried and understood that, we actually no longer used our flashlights unless absolutely necessary, for example, when walking on one of those narrow, tree-lined country roads, where the dense canopy of leaves enveloped us in a darkness that shut out the skies completely; or when climbing up or down the staircase of the ornithologists’ platform at the lake where we stayed for several hours on two nights. Based on our readings and the manifold photographs of night skies that have become so popular in the last few years, I had imagined the darkness very differently, almost glamorous. However, as we went out night after night and witnessed how lights were turned off and what a difference there is between good and bad seeing, this initial disappointment quickly vanished. What is more, we experienced how the night came alive. One of the central aspects of darkness in The End of Night is what Bogard calls “the ecology of darkness,” that is, the night’s bustle with “the basic happenings that keep world biodiversity alive” (131), be it plant or animal life. These ecological patterns, as Bogard points out, have their own time schedule: “The moon rises when it rises, shooting stars never announce their shooting – even the sounds and scents come when they want; you can’t just order them up” (127). Similar to the slow adaptation process of the eyes, being outdoors at night requires patience and receptivity to whatever it is that comes alive. To Bogard, who travelled extensively across the North American and European continents, there were moths, bats, wolves, the sounds of frogs and the barred owl; to us, who travelled 400 kilometers from the west to the east in our own country, it was the enormous chatter of geese on the lake as one of their major stopovers on their long migrations – their noisy chattering no longer makes me consider such a stopover a moment of rest, but more of a social gathering. Their chattering was frequently interrupted by the calls of mallards and other waterfowl, as well as the beating of their wings as they took off and landed on the water’s surface. All sounds are amplified at night, even the noise of the falling raindrops on my jacket during our third night were more immediate, closer, and louder. The night coming alive also includes its manifold scents. As Bogard describes it: “During the day, rising warm air carries the earth’s scents away, but as night temperatures cool and night winds calm, those scents stay close to the ground, waiting like messages for those creatures who can receive them” (137) – and receive them we did. Our first night was an intimate encounter with the fresh smells of the meadows of the wetlands, in the midst of which the field station is located. The night air wafted scents of hay, at times reminiscent of lavender, towards us. Along the lakeshore, scents of wet grass alternated with fragrances of resin and pine, wet sand and the moist wooden boards of the ornithological platform. Both, sounds and scents are richer at night as the human senses are transformed and enhanced. Most of us agreed that walking about and experiencing these nights together, gave us a sense of safety. We felt secure as a group, but most of us would not have gone out at night by ourselves, let alone laid down in a wet meadow for an hour on a late October night. The common western association between light and safety and, conversely, the fear of the dark in our European and American cultures is, to my mind, one of the major narratives that Bogard seeks to counter with his book. He does so by including expert voices and research data that testify to the misconception that an increase of lighting in our environment means reduced criminal activities. Furthermore, he points to the cultural biases that have constituted – and still constitute – our conceptions and stories of the dark, which more often than not devalue, even demonize darkness. Interestingly enough, it did not take too long for our group to bring up the characteristic scenarios of the dark from slasher movies and horror films, and as we startled some sleeping cows with our red lights along the lake shore, some members of our noctambulist group turned out to be almost as surprised as the cows, perhaps even frightened. Bogard draws particular attention to our contemporary culture of fear, its obsession with security and surveillance without, however, trivializing individual anxieties in the dark. This culture of fear, he argues, reinforces the common assumptions “night is dangerous and darkness a threat” (83). Richard Louv, too, expresses his concern about our contemporary obsessions with safety, which he sees evidenced by an excessive legal overregulation. Like Bogard, he considers the safety-craze of our western societies – America more so than Europe – as a symptom of an increasing detachment of individuals and societies from any direct experience of and exposure to the non-human environment. With The End of Night, Bogard wishes to motivate us to know darkness rather than to fear it. I would argue that what makes his motivation successful, however, is his creation of a sublime dimension of darkness, which – as one of my students perceptively noted – derives from the representation of the unceasing contact between human individuals and darkness through the combination of scientific and technological knowledge and artistic as well as poetic imagery. With references to, for instance, Vincent van Gogh’s The Starry Night (1889), Giacomo Balla’s Street Light (1909), as well as multiple citations from selected poetry and prose by nineteenth- and twentieth-century writers (e.g. Henry David Thoreau, Virginia Woolf, Isaac Asimov, Wendell Berry, or Joseph Bruchac), Bogard strikes up a conversation between artistic-poetic insights into darkness and the observations of scientists and engineers (e.g. the French lighting specialist François Jousse, bat expert Merlin Tuttle, the initiator of the UNESCO declaration of the human right to an unpolluted night sky, Cipriano Marin). He thus creates an intriguing transdisciplinary and polyphonic conversation that turns into a major narrative in itself. This narrative of a sublime darkness that unites many voices, multiple perspectives, and diverse fields of knowledge, makes The End of Night such a fascinating and inspiring read. It places the human species of the Anthropocene not at the center of attention, but always in relation with larger cosmological forces at the same time as it articulates existential questions. For example – and notwithstanding the obstructive cloud cover – on the Isle of Sark, Bogard experiences one of those ecstatic moments of contact with darkness: “Tomorrow I will head to Guernsey, a bobbing diesel-churned journey, and find cobrahead fixtures, unshielded lights, the insistent roar of the motors that rule our lives. But tonight in a field on Sark, I lie staring up – and around – at the starry sky, a man on his back in a field, all but disappeared” (190). Although the experiences of our little group in Gülpe were much more modest, I for my part departed without any of the disappointment I had felt when first venturing out into the dark. Yet it was very clear to me that, after all, we humans are definitely not a nocturnal species. Michaela Keck teaches American Studies at the Institute of English and American Studies at the University of Oldenburg. Among her major research interests are ecocriticism and nature writing, women’s literature, and visual culture. For further information, see http://www.staff.uni-oldenburg.de/michaela.keck/.